in the Index window of Chapter 1.
electronic devices, such as personal digital assistants and cell phones. areas such as computer science and telecommunications. Certification program. An A+ Certification candidate must pass two exams. 2. The second exam depends on the type of certification desired. connectivity issues over the telephone or Internet. interaction with the customer and works primarily in a workshop or lab. A depot technician is also called a bench technician. This course will prepare a student for Modules 1-3.
customers of appropriate hardware to buy. to use system tools to repair the problems that may occur. module requires that the candidate understand LAN communication. available for a standalone or networked computer. processing information. Programs or applications perform different functions. motherboard and other internal components. components of the computer from overheating. grounded by attachment to the case. required for all of the components inside the computer. Berg connector is smaller than a Molex connector. • A 20-pin or 24-pin slotted connector is used to connect to the motherboard. slotted connector has two rows of 10-pins each. with the black wires together in the middle. check to make sure there are no bent pins or foreign objects in the way. make sure that you are handling the hardware correctly. • Current (I) is a measure of the amount of electrons going through a circuit. deliver different amperages for each output voltage. power supplies are rated in watts. or a measurement of almost 0 ohms. other. It states that voltage is equal to the current multiplied by the resistance. • Computers normally use power supplies ranging from 200-W to 500-W. However, some computers may need 500-W to 800-W power supplies. enough power for the current components. supply from the same manufacturer. a power supply can hold a charge for extended periods of time. devices on the motherboard. Various form factors exist for motherboards. video card, and the speeds at which the CPU can communicate with them. drives, sound card, USB ports, and other I/O ports. 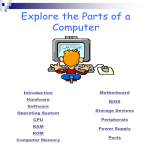 • The central processing unit (CPU) is considered the brain of the computer. CPU manufacturers include Intel and AMD. • The CPU executes a program, which is a sequence of stored instructions. execute these instructions very rapidly. broad set of instructions, resulting in fewer steps per operation. single CPU with hyperthreading appears to be two CPUs. megahertz (MHz), or billions of cycles per second, called gigahertz (GHz). improve computer performance and can result in damaging the CPU. operations that are normally handled by a separate sound or video card. advantage of the MMX instruction set. finding ways to incorporate more than one CPU core onto a single chip. build a powerful, multi-processor computer. cores can process information at the same time. heat builds up, computer components can be damaged. CPU. A fan on top of the heat sink moves the heat away from the CPU. to a radiator to be cooled by the air, and then re-circulated. powered down. The contents cannot be erased or changed by normal means. firmware is actually the software that is stored in a ROM chip. process large programs and files, as well as enhance system performance. electricity in order to maintain the data stored within a chip. • Fast Page Mode DRAM (FPM Memory) is memory that supports paging. and Pentium systems from 1995 and earlier use FPM memory. access cycle to end before another data access cycle begins. transferring data twice per cycle. decreasing noise and crosstalk between the signal wires. Early computers had RAM installed on the motherboard as individual chips. rows of pins used to attach it to the motherboard. several memory chips. SIMMs have 30-pin and 72-pin configurations. DIMMs, 184-pin DDR DIMMs, and 240-pin DDR2 DIMMs. RDRAM chips. A typical RIMM has a 184-pin configuration. memory modules contain RAM on both sides of the module. • L1 cache is internal cache and is integrated into the CPU. near the CPU. L2 cache is now integrated into the CPU. • L3 cache is used on some high-end workstations and server CPUs. • Nonparity memory does not check for errors in memory. • Parity memory contains eight bits for data and one bit for error checking. The error-checking bit is called the parity bit. memory and correct single bit errors in memory. Computers have expansion slots on the motherboard to install adapter cards. • Industry Standard Architecture (ISA) is an 8-bit or 16-bit expansion slot. This is older technology and is seldom used. • Extended Industry Standard Architecture (EISA) is a 32-bit expansion slot. slot. This is older technology and is seldom used. slot. PCI is the standard slot currently used in most computers. connect to the computer using a USB port, a FireWire port, or an SCSI port. older technology and is seldom used. capacity of a hard drive is measured in billions of bytes, or gigabytes (GB). The speed of a hard drive is measured in revolutions per minute (RPM). Multiple hard drives can be added to increase storage capacity. • CD-ROM – CD read-only memory media that is pre-recorded. • CD-R –CD-recordable media that can be recorded once. • CD-RW – CD-rewritable media that can be recorded, erased, and rerecorded. • DVD-ROM – DVD read-only memory media that is pre-recorded. • DVD+/-R – DVD-recordable media that can be recorded once. • DVD+/-RW – DVD-rewritable media that can be recorded, erased, and rerecorded. operating system in the same way other types of drives are accessed. computers and hard disk drives. An IDE interface uses a 40-pin connector. interface uses a 40-pin connector. interface. A SATA interface uses a 7-pin connector. drives. An SCSI interface uses a 50-pin, 68-pin, or 80-pin connector. connectors and one 34-pin connector for the drive controller. host adapter. A wide SCSI data cable has 68-conductors, up to fifteen 68pin connectors for drives, and one 68-pin connector for the host adapter. for drives, and one 80-pin connector for the host adapter. only be connected one way to the drive and drive controller. should be prepared to discuss their selections. has a maximum length of 50 feet (15.2 m). USB port, eliminating the need for an external power source. source. FireWire uses the IEEE 1394 standard and is also known as i.Link. Mbps and uses a 9-pin connector. of 15 feet (4.5 m). NOTE: SCSI devices must be terminated at the endpoints of the SCSI chain. Check the device manual for termination procedures. may damage the parallel interface. SCSI connectors should be clearly labeled. Mbps. The maximum length of network cable is 328 feet (100 m). keyboard and mouse are often colored differently. If the ports are not colorcoded, look for a small figure of a mouse or keyboard next to each port. and provides analog output to a monitor. connector and provides digital video and digital audio signals. RCA jacks and provides analog video signals. • The mouse and keyboard are the two most commonly used input devices. keyboard is used to enter text commands that control the computer. individual user, such as fingerprints, voice recognition, or a retinal scan. authorized person is accessing the data. is widely used for pricing and inventory information. the image on the screen. Most televisions also use this technology. than active matrix but does not provide the same level of image control. called a digital micromirror device (DMD). Each mirror corresponds to a specific pixel. color wheel then adds the color data to complete the projected, color image. dots that comprise a screen. Each pixel consists of red, green, and blue. pitch number produces a better image. higher refresh rate produces a better image and reduces the level of flicker. colors that can be reproduced is the color resolution. inches wide by 12 inches high has an aspect ratio of 11:6.
implementation of PCI slots, USB ports, and FireWire ports. channels that are numbered 0 to 7.
the hardware inside the case and allow for the addition of components. • Typical output devices include monitors, printers, and speakers. resources include IRQs, I/O port addresses, and DMAs. These activities are suggested for use in instructor training. 1. Take the Quiz provided in Chapter 1 course content. make notes of potential issues and questions that students may have. student issues and questions regarding the worksheets. use in completing the research.